July | 2015 | McWane, Inc. 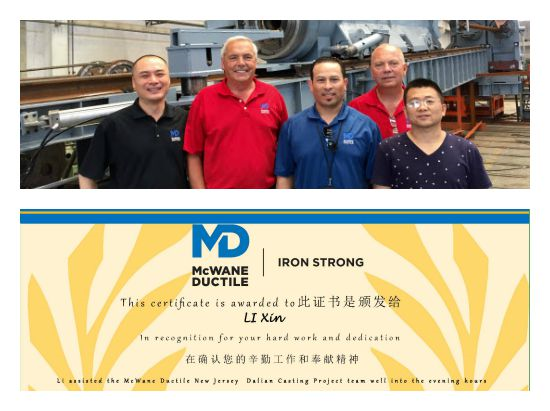 The McWane Ductile–New Jersey (MDNJ) Dalian Casting Machine project team could not have completed its mission critical goals in China without McWane Gulf team member Li Xin’s commitment and willingness to go above and beyond to assist them on their recent trip to China. Li Xin made sure that we had access to their technical counterpart person in China and translated from English to Chinese for us when needed. He also stayed with the team until late hours of the evening. The MDNJ team was particularly impressed and grateful with Li Xin’s effort to insure that the team was kept safe by working through the weekend to avoid the typhoon that hit Shanghai, China. Li Xin has the daily challenge of managing vendors and the expectations of customers, especially in China. To date, they have achieved significant results from our China operations including coordinating the inspection and shipping of three casting machines, one pole finishing line, and testing machines for McWane Services Private Ltd. and McWane Gulf. The MDNJ team unanimously voted to present the McWane Ductile Passion for Excellence award to Li Xin with a heartfelt thank you for his assistance during their recent visit. Congratulations, Li Xin! Happy Friday, everyone! To celebrate the weekend, here is a deliciously healthy recipe to enjoy. Gather your family and friends to enjoy this sweet treat and beat the heat! This raspberry sorbet recipe is a wonderful way to use extra summer berries to make a dairy-free, healthy and light dessert perfect for any hot day. If you can’t find apple-raspberry juice, apple juice works well. Puree raspberries in a food processor until smooth. Pour through a fine-mesh sieve set over a bowl and press on the solids to extract all the juice. Combine water, juice and sugar in a small saucepan. Heat over medium heat, stirring, until the sugar is dissolved. Stir the syrup into the fruit puree. Chill the mixture in the refrigerator until cold, about 4 hours. Pour the sorbet mixture into an ice cream maker. (No ice cream maker? See Tips.) Freeze according to the manufacturer’s directions. Tips: If using frozen fruit, measure it frozen and then thaw before pureeing. If you don’t have an ice cream maker, freeze the mixture in a shallow metal cake pan or ice cube trays until solid, about 6 hours. Break into chunks and process in a food processor until smooth, stopping to scrape down the sides as needed. Make Ahead Tip: Freeze in an airtight container for up to 1 week. Let soften slightly before serving. McWane Ductile-New Jersey (MDNJ) has a Community Advisory Panel (MDCAP) that meets on a monthly basis. The purpose of the MDCAP is to establish a forum for the regular candid and constructive communication between MDNJ and the local community. The MDCAP contributes approximately $60,000 annually to community projects, organizations, and events, and MDNJ makes separate donations to the local community. For example, MDNJ recently revamped their locker room and donated the left over lockers to a local homeless shelter. The MDCAP donates quarterly to five local food banks that help feed those in need with a meal on a daily basis. They also awarded 8 scholarships – $2,000 each – in 2015 to local high school students to help further their education. During the holidays, they participate in the Polar Express and supply tickets to families who would not be able to afford this event, and provide hats, gloves, and food to local residents at the annual tree lighting ceremony. The MDCAP also adopts families during the holidays and provides presents and gift cards so every child will have something special at Christmas. Through the CAP, MDNJ also encourages team members to get more involved in the community. 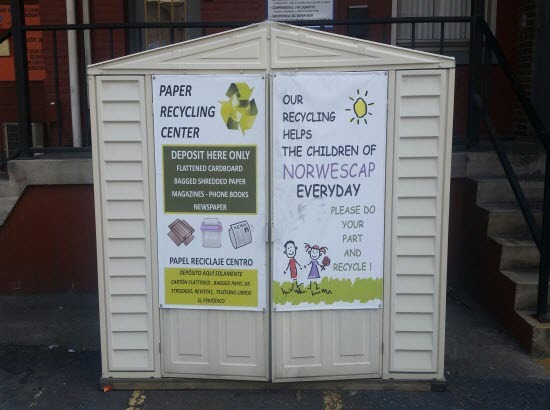 Pictured is one of the many sheds MDNJ has throughout the facility where team members put cardboard and paper items for recycling to help Norwescap, a local children’s center that provides summer classes and after school programs. The Columbus, Ohio, OSHA office recently recommended McWane Ductile-Ohio (MDO) as a mentor to another company seeking VPP certification. MDO was happy to meet with the safety team from Messer Construction Company to share the history of their VPP journey. MDO team member Kent Arnold (pictured second from left) shared MDO’s VPP journey and fielded questions from Messer representatives. Kent’s strong commitment to safety and VPP and his willingness to share McWane’s success is a true testament to his dedication to McWane and the safety of our team members. Since their recognition as an VPP Star Site in 2010, MDO has been asked by OSHA to mentor other companies pursuing VPP certification. In 2011, OSHA picked MDO as a VPP mentor for Republic Engineered Products because MDO and Republic have similar product types and they also share similar safety challenges and hazards. In 2012, MDO mentored Chase Brass & Copper Company located in Montpelier, Ohio. MDO representatives visited Chase Brass four times to meet with hourly and management personnel to answer questions about VPP and tour the facilities to identify safety concerns and share best practices. Kent is a third generation MDO team member and his commitment to safety is not only recognized by his fellow team members, but has been recognized by OSHA as well. He was awarded the OSHA Region V VPPPA Safety Champion Award in 2014 and he travels to other McWane facilities to assist them in reaching their goal of VPP certification. What would you do and how far would you go in order to help find a cure for children’s cancer? Cancer is the second leading cause of death in children (after accidents), and about 1,250 children younger than 15 years old are expected to die from cancer in 2015. Because of major treatment advances in recent decades, more than 80% of children with cancer now survive 5 years or more. Overall, this is a huge increase since the mid-1970s, when the 5-year survival rate was about 58%. Still, survival rates vary depending on the type of cancer and other factors. 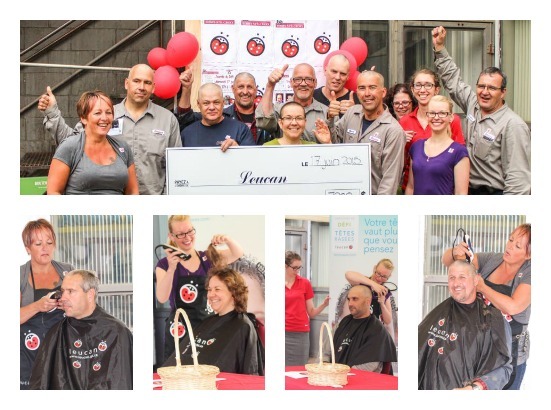 On June 17, nine amazing team members from Bibby-Ste-Croix took the dramatic step of shaving their hair off to raise money for cancer research. The ten heroic team members were Claude Marcoux, Dave Méthot, Jacklin Nadeau, Jean-Paul Côté, Luc Carrière, Marcel Daigle, Sophie Bergeron, Steve Lemay, Sylvain Daigle, and Yves Olivier. We are pleased to report that they raised $8,000 – $4,000 from individual donors and $4,000 of matching funds from Bibby-Ste-Croix! We want to thank the team members that took the brave step of sacrificing their hair for this worthwhile cause. 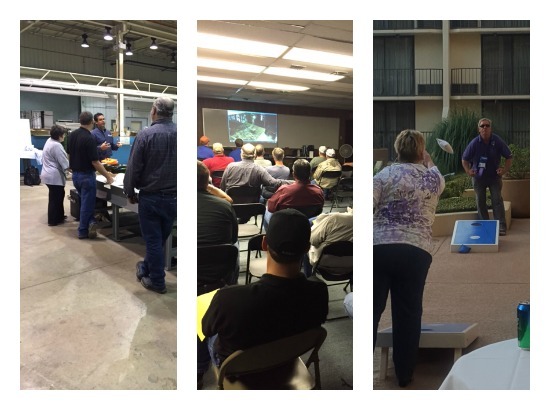 Tyler Pipe and the McWane Plumbing Group were proud to have the opportunity recently to host a plant tour for attendees at a meeting of the Texas State Association of Plumbing Inspectors (TSAPI). The TSAPI held their annual conference in Tyler, Texas, from June 7-11 which included continuing educational programming and other activities both at the conference center and around town. 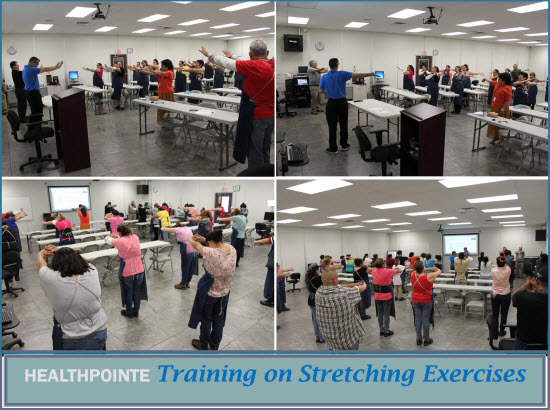 Inspectors from the around state of Texas attended the conference. A total of 46 participants signed up for lunch and a tour of the Tyler Pipe facility. The tour started with a brief history about Tyler Pipe and safety instructions for the foundry tour. Everyone seemed impressed with Tyler’s manufacturing processes, stringent testing procedures, and quality standards that help make Tyler Pipe the largest producer of cast iron soil pipe in America. Tyler also hosted a Med Gas class on-site. This training is required in order to maintain a Plumbing Inspector’s License. The old pattern shop provided a nice area where the instructors could demonstrate techniques around a large table. Team members from Tyler Pipe and the McWane Plumbing Group also participated in activities after-hours which included the President’s dinner, a raffle, and games. EST Representative Victor Hatcher built a custom set of inclined boards so everyone could play a fun game of corn-hole. At the end of the day, there were numerous compliments about the foundry and the hospitality shown to the association. Gail Lux, president of the association, presented Tyler with a certificate of appreciation on behalf of the TSAPI for their generous time and effort shown. Lt. Governor Kleefisch (center left), Steve Hansen/General Manager (center), and Brian Satula/Administrator WEM (center right) with Solberg team members. 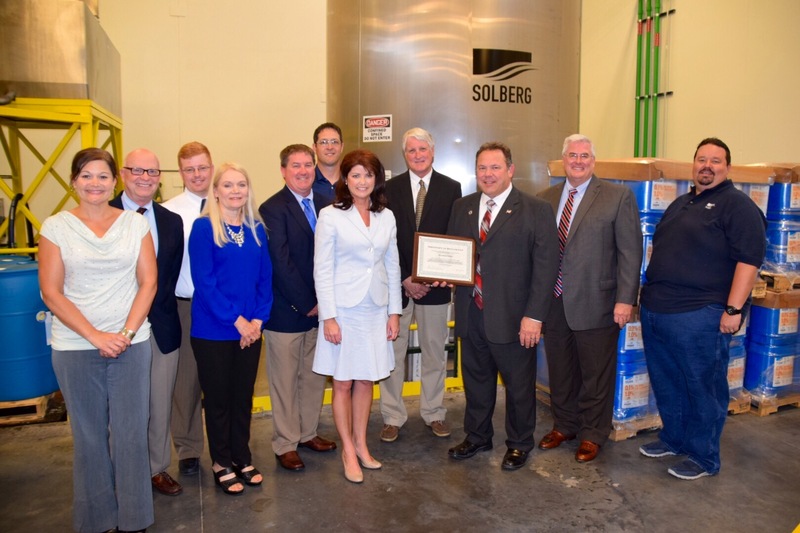 Lieutenant Governor Rebecca Kleefisch and Administrator Brian Satula (Wisconsin Emergency Management) stopped by for a tour of our Solberg facility in Green Bay, Wisconsin, on Monday, June 29. Solberg is the firefighting foam division of Amerex Corporation. Lt. Governor Kleefisch thanked team members for their dedication and support to public safety in Wisconsin and discussed the establishment of a public/private partnership on firefighting foam between Solberg and the Wisconsin Emergency Management. Under the cooperative agreement, the state will have access to a supply of firefighting foam in emergency situations such as a crude oil fire or other large scale industrial fire incidents.